Rick Vosper's recent opinion piece titled "Cycling is the antidote to childhood obesity" should rightly serve as a warning sign to anyone in the bicycle industry. However, Mr. Vosper's criticisms are ill-informed and his proposed approach will not in itself move the needle toward increased ridership in any significant way. 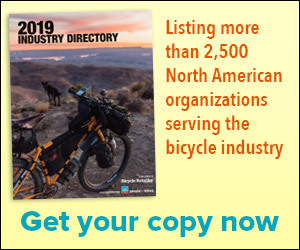 The U.S. bicycle industry has been in a near-constant state of flux since the mid-'70s Bike Boom. Forty years later, things are finally settling down and likely to stay that way for years to come. Yet two looming market disrupters have the potential to significantly alter the new reality. Opinion: Are electric scooters a threat to the e-bike industry? The electric scooter (e-scooter) boom has taken many by surprise, including those who set legislation in our cities. But, why have they taken off so quickly? After a year filled with surprises and new challenges to our industry, I want to challenge each of us all to embrace new avenues and solutions in the new year. In our ongoing national childhood obesity crisis, kids are the fish, parents are the barrel and we in the bike industry are Elmer Fudd holding the jammed gun, staring into the business end and trying to figure out what the heck is happening. I'd like to reintroduce you to the PBMA with this long-winded rant and rave. Tariffs are a great way to teach geography, as well as a smattering of international economics. Former industry member Trey Richardson looks at the Interbike cancellation and more. Like anyone who has invested a good portion of their livelihood in this industry, my heart sank to the news of Interbike being canceled. Anyone can say what they want about Interbike. But I don't believe John Burke, Mike Sinyard and the others who sit at the top in this industry would be here if it weren't for Interbike. Wow, and we thought the ASE and Performance bankruptcy was a big deal. I thank BRAIN for allowing me a space to reflect on A Day That Will Live in Infamy. The Day Our Trade Show Died. Interbike died Wednesday at the age of 36. It was a death with little grace. It was painful. Quick. The numbers left few choices. Business is business. Nonetheless, it's personal for those who lost their jobs and for those who, for years, met at Interbike. Long lasting friendships were made there. I know. Let's remember that, and let's think about that for a moment. The former IBD owner says international trade agreements that label products' intended destination could solve gray market issues. A counterpoint to Don DiCostanzo's recent guest editorial. Linus' sales manager says independent retailers offering multiple brands are the future of bike retail. The founder of Pedego says the future of bicycle retail is in single-branded stores. The long-standing BRAIN print column makes its online debut today. "After almost 50 years in the bike industry, my father, Bill Duehring, has decided to part ways with Felt Bicycles and take some time for himself to focus on family and health," writes Megan Duehring. Santa Fe retailer Charles Verral says, "We should all be grateful for dealer agreements, preseason commitments, manufacturers' set prices, and other evolving systems like click-to-brick. " "My challenge to you, the store owner or manager, is to begin paying your best mechanic one-third of your store's hourly labor rate," says James Stanfill. As a U.S. manufacturer, there are unique major challenges that we face and because of this, we support the administration's additional tariffs on Chinese bicycle racks and components. I founded Specialized on the belief that cycling changes lives. I’m living proof of that fact.